Let’s get something straight. True marketing and sales alignment is achieved by looking at everything we do through the eyes of the customer. The functions of sales and marketing share almost identical goals – to drive revenue and delight customers. Yet, in many B2B organisations, the two departments are often disconnected and have a contentious relationship. There needs to be a shift in our thinking. Does this sound like your organisation? Most organisations still believe in a traditional view of sales and marketing delineation: marketing’s job is to create awareness, and sales’ job is to generate leads and turn them into customers as they are responsible for delivering revenue. In practice, though, marketing and sales need to work in tandem to align their roles and goals and ensure that lead generation and ROI become a shared responsibility. Let’s do a quick sense check to see if your teams are aligned. Is your marketing team generating quality leads for the sales team? Is marketing aware of sales goals and focused on the company vision? Was the sales team involved when creating the marketing strategy? Do your sales and marketing teams meet regularly to discuss strategy? Does everyone understand and agree on what differentiates you from the competition? If you answered no to any of these questions, you’ve likely got some work to do on aligning these two teams. Never fear though, you’re not alone and with a renewed and shared focus, it can be turned around. Lack of alignment is not only inefficient, but it also inhibits the effectiveness of your sales and marketing processes. Since sales and marketing are the biggest drivers of your company’s revenue and success, you should make sure everyone is on the same page about what you're trying to accomplish, and how you want to measure success. For B2B organisations to grow today, the legacy sales and marketing model will stifle growth. Why? Because the way B2B decision makers and influencers make purchases has changed. They are digitally driven, socially connected, mobile, empowered and have nearly unlimited access to information and people. And organisations have access to more and more customer data which, if used effectively, can help to better understand and connect with these changed buying patterns. The new reality is, this is forcing us to rethink how sales and marketing can work together. Integration is key. Marketing needs to know more about sales, sales needs to know more about marketing, and they need to know more about the customers to be connected with them throughout the entire buyer journey. True alignment involves many things: shared goals, common milestones and metrics, smooth business processes, and smart technology investments. But, first and foremost, alignment at its simplest is about communication and collaboration. If sales and marketing can’t learn how to work together as a single team, speak the same language and exchange information freely, then all the technology in the world won’t make a difference. As an organisation grows, the lines of communication often begin to break down. It’s not uncommon for marketing teams to have very little knowledge of the sales process and for sales teams to be unaware about the marketing effort required. They are likely unaware that marketing can even assist and provide increased value by connecting with the customer at all stages of the buyer journey and not just at the top of the funnel. Communication will open discussions regarding challenges the teams are experiencing and allow them to collaborate to solve them. For example, sales can gain access to high-value content at various stages of the buyer journey through better sharing of information with marketing. And marketing can better target the right customers with the valuable customer intelligence sales can bring to the table. If both teams share a single customer view and what constitutes success, then your organisation, in turn, will be benefit. In a nutshell – here are some best practices to get sales and marketing alignment started. Share goals – Align marketing ideas with sales goals. It’s important that mutual goals are agreed upon and measured often. Everyone should know the end game. Share definitions - There are a number of different terms used in sales and marketing. For example, what constitutes a visitor or an enquiry vs. a lead? What constitutes a qualified lead? There needs to be a shared understanding regarding what these words really mean and who has responsibility at each stage of the buying process. 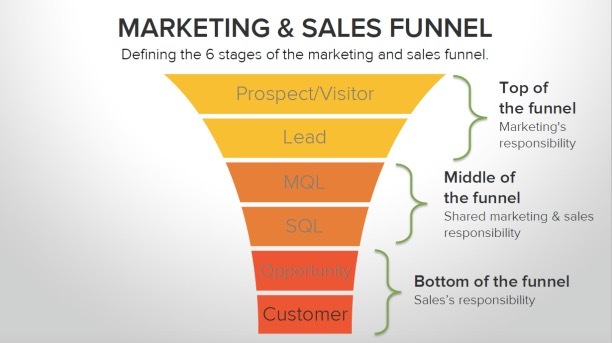 Where does marketing end and sales begin? Collaborate - Sales is often the front line to the customer, and with so much customer interaction online, marketing has access to a great deal of valuable insight. It’s essential that both teams consistently provide feedback to one another. Communicate - Once the two departments are aligned in terms of their definitions and goals, it’s important to encourage an ongoing dialog. At a minimum, establish weekly meeting between sales and marketing teams. Get aligned and win bigger as your sales and marketing teams communicate better and reach goals with shared responsibility.